If you are an Indian diagnosed with Diabetes, one of the first things that comes to mind is "How many carbs do the standard Indian dishes contain?". This article lists the carbs in some of the most popular Indian dishes. You must still follow the general principles of good diabetic eating which is avoid foods that are high in sugar and carbohydrate values such as rice and potatoes which are very high on the list of staple Indian diets. Tied to diabetes is the risk of heart disease so you must also ensure that you eat foods that are lower in fat and cholesterol. It is recommended that most diabetics eat between 200-240 carbs/day or restrict their intake to 2000 calories or less. Most nutrition data will provide you nutrition information in terms of 15 g of carbs or 1 serving. The table below also provides the information in terms of 15g of carbs. It is recommended that most diabetics have around 45-60 grams of carbs for breakfast, lunch and dinner and 2-3 snacks a day of about 15 carbs. For product related nutritional information, see our Indian Food Nutrition Information Guide. We have been asked the question, "What is Indian Food like?" many times and I have always struggled to answer this question because there is no easy answer. India is a vast and diverse country and each state is a country in itself in terms of its food, dress, language etc. You can eat Momo's from the North East, Sambhar in the South, Dhokla in the East and Dum Aloo in the North and they are all unique and fascinating. The North has Mughal influences while the East has Chinese influences, all making for a great dining experience. With the recent economic growth in India, many of these dishes are now available in the big cities. However, its probably best to travel to the respective states to savour the real taste. 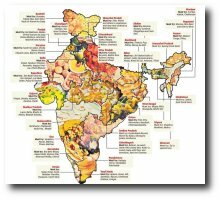 We recently came across this India Food Map that lists some of the Must Try dishes in each of India's states and it answers tha question "What is Indian Food like?". Now I can send anyone who has this question to this map. Click on the Read More link below to see a larger image of the map. We get many emals asking for Ms Tarla Dalal's Non-Vegetarian Recipes and the simple answer is that there are none. 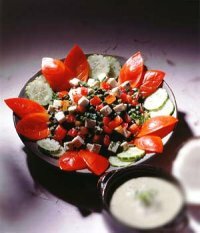 Ms Dalal is an author of Vegetarian cookbooks and to the best of our knowledge, there are no chicken, mutton, pork and beef recipes by Ms Tarla Dalal. We do carry a few of her popular vegetarian recipes on this site. You may have seen many restaurants with the sticker saying Zagat Rated Restaurant and I was curious to see what that meant. I did not see any further information about what the rating meant and below are my findings. Zagat was company started in 1979 and used to rate restaurants across various parameters. Today they rate many things such as hotels, attractions, night life etc. With respect to restaurants, they evaluate restaurants on 4 parameters Food , Decor, Service and Cost . The ratings are determined through Zagat Surveys which are completed by people who are considered to be knowledgeable in that field. I am not sure how they actually go and figure this out. With Zagat.com, more users can provide these ratings.